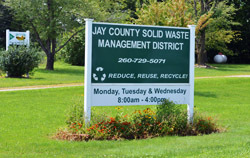 The Jay County Solid Waste Management District is Jay County's source for recycling and waste reduction information. Since its inception in 2002, as a special district of the Jay County government, the district and its staff have been dedicated to providing residents with unique recycling and waste reduction opportunities. From electronics recycling to environmental education to household hazardous waste collection, the district offers a multitude of programs for Jay County residents. The district also offers assistance to businesses and organizations.